In the Southeast and Southwest, managing feral hogs is a conundrum without a simple solution. Appeared in print as "Hog Havoc"
Feral hog management is challenging on vast tracts and less so on smaller ones, but one thing is certain: constant effort is required if you want to severely curtail populations. I felt like a space invader from another planet as my hunting host — well-known predator hunter, TV host and hog-hunting fanatic — Byron South and I slowly moved across the wide-open pasture in the dark. As we did, stygian, glowing shapes appeared in our night vision scopes. At the time, I didn’t realize that a hog’s eyesight was similar to humans. As we are, they are virtually blind on a dark night. This night, several eerily glowing pigs were busily rooting up the field 100 yards out. We settled our night-scoped AR’s across the gun’s bipods and dropped a pair of hogs. Quickly, Byron dropped a second hog on the run. I managed to get on a second hog, just as it reached the edge of the woods, and put it down for the count. It was wild and wooly East Texas action. Feral hogs are expanding rapidly in many southern states. Populations are virtually uncontrollable, causing millions of dollars in damage to crops and property annually. Texas alone has an estimated population of more than 2 million feral hogs causing an estimated $50 million in damages to crops per year and inestimable damage to wildlife habitat. 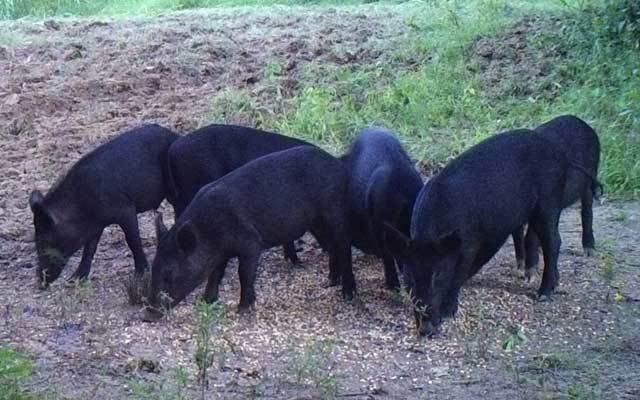 According to biologists, you have to take 70-80 percent of the hog population in an area on a sustained basis just to maintain the status quo, a near impossible feat in most areas overrun with hogs. Some Texas politicians and the director of the Texas Department of Agriculture figured they had the answer to the hog problem. Without a whole lot of study, they adopted a hog-poisoning program, choosing to use a powerful anticoagulant warfarin-based bait, Kaput Feral Hog Bait. This poison kills by causing excessive bleeding. According to studies conducted with similar products in Australia, it takes seven to 14 days for the poisoned critter(s) to die a slow, miserable death. Many Texans including hunters, non-hunters, ranchers (with hunting operations), hog meat processors (one of whom processes 5,000 feral hogs per month and pays from $30-$180 a hog), took exception to this questionable method of feral hog eradication. Jointly, they filed a lawsuit. A judge put its use on hold, and the legislature stopped its use entirely until further studies are completed to assess its overall impact on collateral damage to domestic animals and wildlife. According to Gary Roberson, owner of Burnham Brothers Game Calls and a lifetime resident of Texas, there were no feral hogs as late as 1985 in Menard County, where his ranch is located. Today, you can drive the backroads and see feral hogs in abundance. Gary believes hogs can be controlled reasonably on small areas by hunting with dogs and trapping. But on larger tracts, management has to be an ongoing endeavor as neighboring hog populations will soon fill the void left by those removed. Hogs are incredibly intelligent. Quickly, they become almost impossible to trap with visible hog traps. According to Roberson, the most efficient and effective hog trap available is the Boarbuster Hog Trap, a unique, heavy-duty, drop-down trap designed to rotate so the trapped hogs cannot root out. The trap door can be actuated by a combination of video camera and cell phone, controlled remote from virtually anywhere in the world. You can watch the hogs entering the trap via video at the same time you’re watching Sunday football. When there are enough hogs inside, you trip it. Amazing technology! I have been on many feral hog chases with dogs, and in past years have sold Plott hounds to several Texas hog hunters for running hogs. Hunting feral hogs with dogs is probably the second-most effective hog control method in areas where such hunting is feasible. On a recent half-day hog hunt, Gary and his hunting partners took 21 hogs using hog dogs. However, there are places such as the hospital and medical school campus in a small Texas town that has been under attack by hogs from the surrounding swamps, where dog hunting is impossible. In the last several years, South has taken about 100 hogs from this in-town property by hunting at night with the latest night vision optics, coupled with fully suppressed rifles and careful shooting. During the day, he makes use of his newly designed electronic Bullet HP Bluetooth game call by using a variety of hog vocalizations. As I stated earlier, hogs are smart critters with a keen sense of smell and hearing, limited only by their comparatively poor eyesight. In most highly populated hog habitat theses adaptable animals are mainly nocturnal, so effective night hunting gear is essential. However, they are also extremely social, vocal and territorial, which makes them susceptible to calling. South believes that calling early in the morning and evening extends his hunting time, adding to his nighttime forays and increasing his effectiveness in controlling hogs. You cannot argue with his success when his yearly average is about 500 hogs. Hogs may be raising havoc wherever they roam but they also provide plenty of hunting opportunity and are darn good eating. T’aint all bad!